We were not exterminated and never will be! everywhere new pockets of resistance join the struggle. 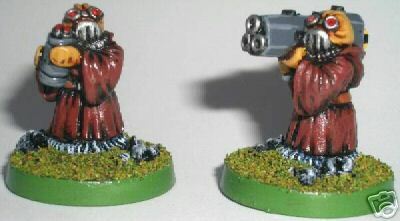 Behold the advent of the space dwarfs. We will not be banished! We’ll find our own systems! and we shall win this war! Just one set form this German company. 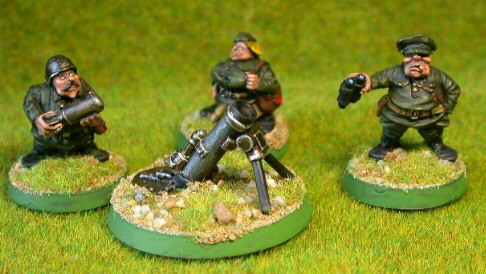 These ones are beardless Soviet dwarfs with heavy artillery! 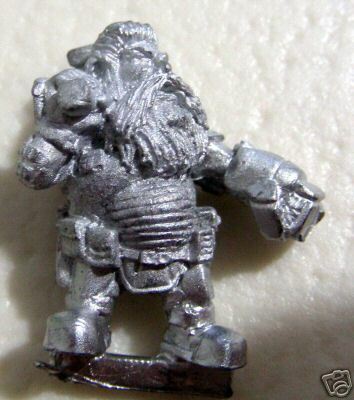 This German company has an original range of small dwarfish creatures called Maygons. 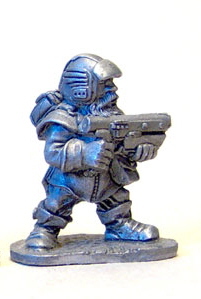 Even though they may look more like halflings, a few of them might be quite useful for a space dwarf force. 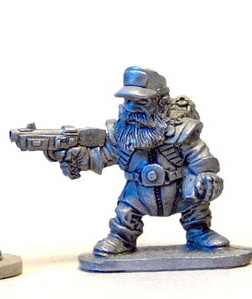 Foundry's Street Violence range includes seven dwarfs by Shane Hoyle. Obviously inspired by a certain rockband and heavily armed. Curiously, without doubt part of Foundry's cunning marketing strategies, four of them come with a Snowwhite like figure and the other three, that used to come free with a 'collection deal', now appear to be discontinued! 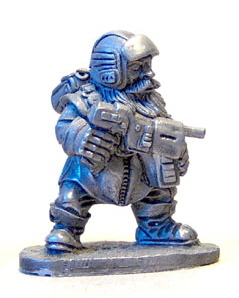 As part of their Shadowrun line miniatures, for the cyberpunk-fantasy roleplaying game of the same name, RalPartha has a small selection of futuristic dwarfs. A beardless native american dwarf, maniacal shadowrunners and several halfling types and 'meta humans' that could find a place in a space dwarf force. 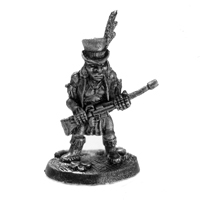 Ralpartha miniatures generally are on the small side of the 25-28mm scale. 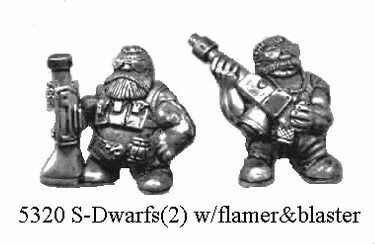 An interesting range of dwarfish aliens. All wear gasmasks, but I believe they're supposed to be some sort of mole-men. 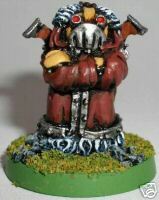 The masks of course makes them kind of generic and suitable as space dwarfs. 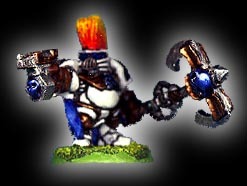 Unfortunately the pics and paintjob do not show much of the sculpting quality, but they look fun. 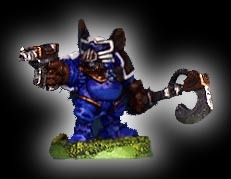 A small e-bay store that occasionally sells his own range of space dwarfs. Sculpted by Bob Olley. 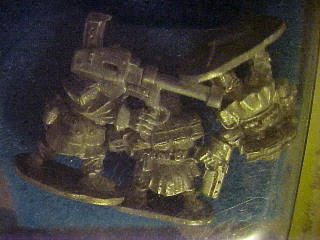 The range includes heavy weapons and exo-suits. No pictures available at the moment. 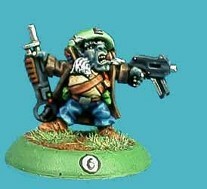 Another Ebay outfit selling a single space dwarf character. 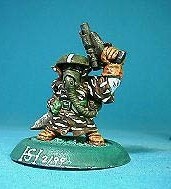 Short lived Canadian company Enigma made some miniatures somewhat similar to Warhamster 40K miniatures. Intellectual Property S.W.A.T.-teams intervened quickly and the company was forced to stop production. 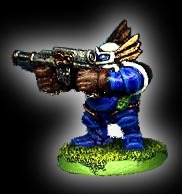 Their Space Dwarfs were actually relatively original, and apart from being dwarfs with guns didn't have that much in common with the GW ones. You may still find some second hand. 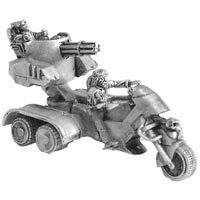 Two packs of Dwarf bikers were or were about to be released too. These may be hard to find. Pictures courtesy of David Dresch. 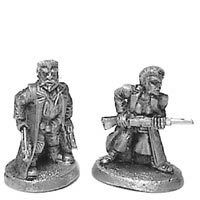 This company used to make the 'Macho Women with Guns' miniatures for the BTRC game. 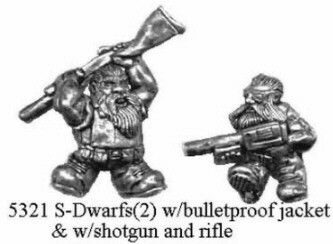 Among the official miniatures (alledgedly including macho-women and bunnies) were six dwarfs with guns. 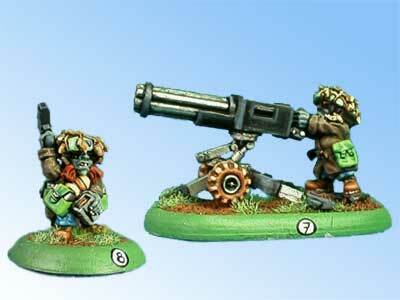 These appear to be Bob Olley sculpts and very similar to the Scrunts above. Report to page 1 of the showcase. You can leave your comments on this showcase on our Froth Forums, or send them directly to the Colonel's general staff here.